Hello, there. How's the facebook time-out treating you? It's going well around here, I've been able to focus on some things around the house that I've been slowly working at getting better at. The two that have been my biggest improvements this week? Usually, how it works around here, is that the boys collect the laundry from around the house throughout the week, and Jeremy and I run the loads through. The boys rotate the clothes (not always, but about 1/2 the loads in a week) from the washer to the dryer and start it. Then all we have to do is put a new load in the washer. Jeremy folds them. And I would put them all away. Though the boys do their own, and Morgan mostly puts hers away by herself. Boy, oh boy, do we generate some laundry!! As I'm sure some of your families do! I've been feeling like I wanted to take a load off of Jeremy, even though he says he truly doesn't mind folding on the weekends. He has been working his normal 40 hour work week (with a 3 hour round trip commute) then an extra 8 hour day on one of his normal days off. He's been doing this for about 5 weeks already, and it will continue for another 6-8. So the both of us have been so exhausted when we come the end of the longer week. 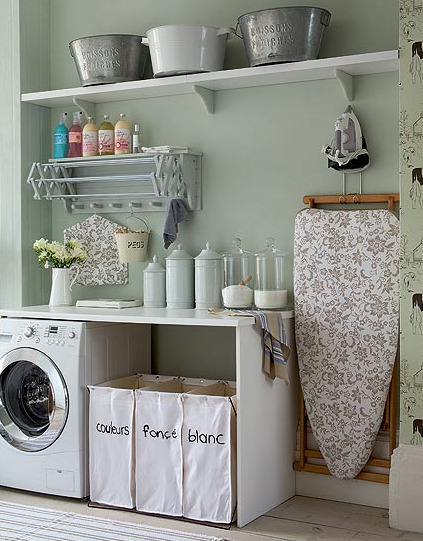 This is definitely not my laundry room, but itsn't it lovely? Each day, I wash the laundry from one of the three places where we collect laundry: the boy's room, girl's room, or the upstairs bathroom that collects ours and the babies' together. Then I wash, dry, fold, and put away that load. It seems so easy, and takes so little time out of that day to do one room's worth, that I have NO idea why I didn't do this before. It is so rewarding to see our spot where our clean laundry accumulated all week - EMPTY at all times. Some days there is none to do, and that's a miracle, except I'm probably running through a load of cloth diapers, which I do every other day. And that's so easy, it's nothing. And the other is the dinner thing. I've always loved to put dinners together. But it can be such a chore when unprepared. The meat is frozen, you don't have on hand what you thought you did, yada, yada... This week has been so great! And not by anything I've done, it's all because of a TURKEY. It was a week of good eatin's around here! I am so in love with pre-cooked meat you can just throw in your recipes. (And that doesn't happen very often.) And I used the very last of the turkey tonight in that yummy soup. We never got sick of it, it was a delicious turkey! Now if I could be so prepared next week. Have you had areas of improvement this week? I'm sincerely enjoying my time away from the computer. Facebook is so dispensable for me. Even though right now I'm missing the front end of our dear friends' trip to Eastern Europe to meet their two new children through adoption and just the day to day interaction with people I know and love... I really am great without it. I'm better without it. So I'm contemplating what I'm going to do with it once this week is up come Monday morning. Do I go on sparingly, like on a schedule? Stay the same as before, just needed a break? Cut it out totally? Hmmm... whatcha gonna do? I'm going to seek the Lord, and ask him what he'd have me do, wait for his answer, and then I'm going to do that. 5 comments on "day 5 - some improvement"
Hey! I'm Laura. I am late, but I'm excited to join you on the Facebook break. I will start today and go for at least a week. I can't wait! WOW! You are doing great, Girlie! I'm so impressed and proud of you for making the changes in your life you feel called to make. The laundry schedule sounds awesome. We are trying to catch up on ours because of a busy couple of weeks. The dinners sound fabulous! Doing turkey in different ways for all the dinners is a great tip. I don't wonder that you wouldn't get sick of eating turkey every night for a week, especially since you put different things with it, and cook it in different ways. As for facebook, I don't know. I used to get on through my Mom and Dad's account, but something happened to me with it that I won't ever get over, and God convicted me later that morning that there are some forms of media that I should cut out of my life, so I cut out facebook as a result. It's just too time wasting and there are other things that I should and could be doing instead. Thanks again as always for posting. OH, the picture of the laundry room, I know it's not your's but it's a cute picture nonetheless.